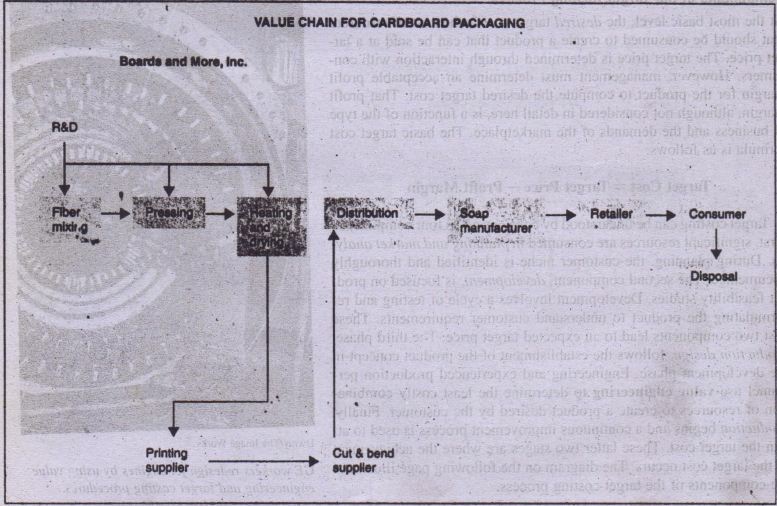 To illustrate the target costing process, we will use Boards and More, Inc the company previously discussed, One of Boards and More’s product lines paper packaging prod. In a recent survey of the soap box market by .30 are is and More’s Marketing and Planning Department, customers expressed dissatisfaction with currently available packaging. Further analysis revealed soap manufacturers believe the packaging is too heavy, increasing ·their shipping costs. Soap consumers are also unhappy with the print used because when the boxes get wet, the printing bleeds or rubs off. The product creation team consists of marketing, design engineering, accounting, and production engineering personnel from Boards and More and similar personnel from the printing firm and the soap company. The charge to the team is to create new paperboard for the cardboard soap boxes that satisfies customers’ needs. Observe that although Boards anti More leads the new product team, all members of the value chain should participate in new product creation. If the new cardboard created by Boards and More is of a lighter weight but cannot properly absorb print, then the solution is not viable. 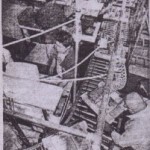 Similarly, if the cardboard is lightweight but its strength does not allow proper filling by the machinery at the soap manufacturer, then the solution is not feasible. Finally, in addition to the design changes that Boards and More considers undertaking. other team members from the printing or soap companies may want to modify or change their processes in order to satisfy the ultimate customer, the soap consumer. The marketing team members provide information about the customer requirements and the design engineers link those requirements to the functions of the paperboard. A small sample of relevant requirements and functions is listed below. The “high” or “low” indicates the importance of the function in satisfying the requirement and the .,+” or “-” indicates if the function and requirement are positively or negatively associated. The requirements/functions table helps the design engineers to focus on product functions that can best meet the needs of the customers. In this case, the ability to bend and cut the cardboard is very important for how easy the box is- to our, its weight; and its strength. Unfortunately, the current technology in paperboard implies that although lightweight cardboard is easier to bend and cut and is easier for the consumer to pour, it is not strong enough to meet the soap manufacturer’s requirements. It seems clear from the table that if the box could be made stronger while simultaneously· maintaining light weight and high absorption, several consumer requirements could be met. Of course, the problem of the additional cost associated with the lighter weight paperboard must be considered. The marketing members of the team must determine the target price consumers are willing to pay to gain the desired requirements, After market surveys, it becomes clear that soap consumers are unwilling to pay more than the current price of $4.50 per box for the desired requirements. The soap manufacturer is thus unwilling to increase the amount it pays to Boards and More. $2.30″ for the printed soap boxes. Additional investigation reveals competitors are about to release new packaging designed to solve some of these problems=-plastic bottles. The plastic bottles are lightweight and strong and have labels that eliminate the printing problems. because of pouring problems. The narrow neck of the plastic jug causes the powdered soap to clump together as it pours, creating problems for the consumer. It is dear however, that competitors are working to solve these problems. The ‘design engineers, working with the accountants who have gathered ABC information, have come up with a potential solution to meet customer requirements as. illustrated below. The design engineers propose an initial target cost of $1.77. 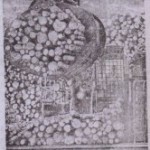 Lowering the wood fiber content of the paperboard and using microscopic plastic fibers that reduce weight and increase strength generates this initial target cost. The new mixture would require fewer pounds of pressure when being rolled but would require longer drying timeand higher heat during drying. The paperboard would then be ready for printing. However, the printing company determines the new paperboard would require new printing technology because of absorption problems created by the plastic fibers. The new paperboard would increase printing costs-by $0.03 and the total cost by $0.05 per box ($1.72 to $1.77). Because the initial target cost of $1.77 is too high to maintain previous margins, value engineering becomes critical. Cost must be driven out of the value chain or the proposed solution will not be acceptable. 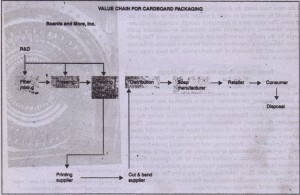 One piece of the value chain not yet considered is the bending and cutting used to create the box. Boards and More approaches the supplier that bends and cuts the boxes before they are shipped to the soap manufacturer. Boards and More asks for a price cut of $0.03 from the current price because the bending and cutting process should be easier and less costly, and the supplier agrees. 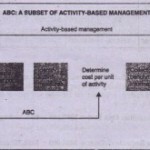 Then Boards and More suggests splitting the remaining $0.02 of the total cost increase with the printer to achieve the target of $1.72, the price the soap producer is willing to pay. The printer agrees to the $0.0 I reduction and Boards and More finds a way to cut $0.0 lout of its. heating and drying costs. Through value engineering across the value chain, suppliers . and producers are able to arrive at the desired target cost.